T urns out there were lots of hilarious Jimmy Olsen stories. 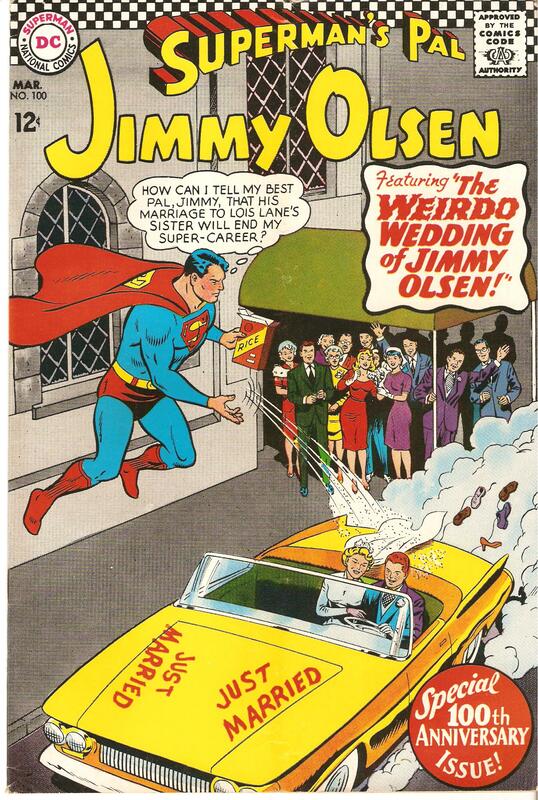 Mostly drawn by the wonderful Curt Swan, they often featured glamorous women who wanted a romance with Jimmy. These beauties, usually from outer space, would always be disappointments. Jimmy’s new love would be a plasma person, or 20 feet tall, or married to four husbands already. Funny stuff. I think I’m going to keep the stories that represent my favorite years of reading comics. Sadly, by the time the hundredth issue rolled around, although Swan was still doing the covers, inferior artists were drawing the stories. And the tone had become more serious and violent. But these older ones are charming. And there’s the occasional story drawn by Jim Mooney or Kurt Schaffenberger to glam it up, not to mention Bizarro Jimmy stories drawn by John Forte and likely written by E. Nelson Bridwell. Okay, okay, I admit it. I still love my Superman comics. The Jimmy Olsen stories feature all the regular characters: Clark, Lois, Lucy, Lana, Perry, Professor Potter, and even Supergirl. Definitely keepers. I always had a soft spot for this issue. I believe CC Beck’s former sidekick, Pete Costanza, did the art on this story.